Perhaps no word is more important in the lexicon of The Fuller Center for Housing than that word, partnership. It’s not just a word bandied about with no real meaning — it’s the very essence of how The Fuller Center helps families with an empowering hand-up. 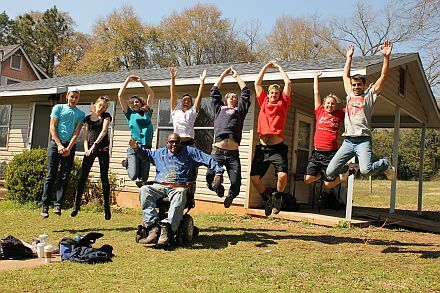 Our homeowner partners work alongside our volunteers, contributing sweat equity in the building and repairing of houses. We’ve had wheelchair-bound, blind, deaf and elderly all put in more than their expected share of sweat equity on job sites. In instances where someone may be physically incapable of sweat equity, their family puts in the hours. By contributing sweat equity, our homeowner partners retain their pride and an enhanced feeling of ownership. They also are expected to pay it forward, literally. Those who build new homes in partnership with us repay the costs of the work on terms they can afford, over time, with no interest charged and no profit made. Even with insurance and property taxes factored into their payments, it’s usually hundreds less than an amount for which they could rent a substandard apartment — or sometimes, even a room! And, those payments go into a Fund for Humanity to help others in their local community get the same kind of hand-up into decent housing. This recycles the generosity that begat the initial project, and it transforms the homeowner partners into givers themselves. Those are the expectations. However, what we see from most Fuller Center homeowners is a commitment that goes above and beyond what is merely expected. They don’t pay it forward out of guilt — they do it out of the pure joy of giving back. They’ve seen both sides of giving and receiving and learned that the Greater Blessing as promised in the Bible — that it is more blessed to give — is absolutely true. What we see from most Fuller Center homeowners is a commitment that goes above and beyond what is merely expected. They don’t pay it forward out of guilt — they do it out of the pure joy of giving back. Our twice-yearly newsletter went out to many of you last month. Mainly, it’s simply a communications tool, a way to update folks on the good work going on across the U.S. and around the world. Naturally, for those so inclined, there is a response envelope for those wishing to donate to the cause. Over the years, we’ve received everything from a nickel to checks for thousands of dollars in those envelopes. Once again. we received a gift from Celeste Allen of Shreveport, La. 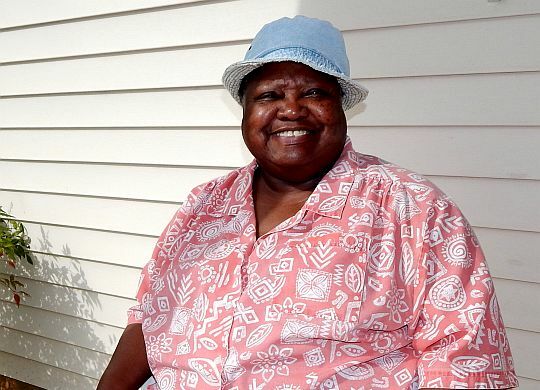 Ms. Allen was one of our first homeowners, partnering with us 10 years ago in Shreveport’s Allendale neighborhood, an area once so blighted that local authorities warned us not to work there. Dozens of Fuller Center homes later, it’s now an area of choice for families. 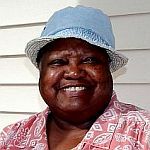 Few are happier to see the neighborhood thrive than is Ms. Allen, who may not be rich but has a wealth of generosity and good will. Some pay it forward with labor. 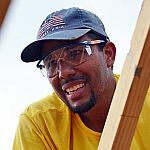 When I first met Camilo Leal at the 2013 Millard Fuller Legacy Build in Atlantic City, N.J., he didn’t know what to think of all the volunteers who traveled from all parts of the country to help his family — and more than 20 others — repair their homes after SuperStorm Sandy. As one of the many residents who had been completely overlooked and forgotten in disaster assistance of previous months, he wondered what the “catch” was. By the end of the week, he understood why they had come and was in tears. At the last three Millard Fuller Legacy Builds in Louisville, Ky., Shreveport, La., and Valley, Ala., Camilo was there, using his precious vacation time and paying his own way to help others in the same way those volunteers had helped his family. He wears his emotions on his sleeve with a constantly beaming smile interrupted by occasional tears of joy and gratitude. Thad Harris, meanwhile, is an all-of-the-above kind of guy. He’s a Fuller Center homeowner partner, a supporter, a local board member, a spokesperson and a construction leader for teams of U.S. Builders who come to work with the Americus-Sumter Fuller Center for Housing. Requiring Thad to perform 350 sweat equity hours from his wheelchair might seem onerous to some, but Thad embraced the opportunity, which he says “woke something up” inside of him. We are thankful for everyone who supports this ministry, but we are especially thankful for those who accepted a hand-up in partnership, then paid it forward above and beyond expectations. At some point, Ms. Allen, Camilo and Thad were looked upon by others as charity cases. When we extended a hand in partnership, we discovered inspiring, giving people. If those three folks are “charity cases,” the world could use a lot more of them. Thad Harris, with a group of U.S. Builders from The Ohio State University.